There have been a couple of threads on the SSUK forum about Varios. The main ones seem to be the WSTech, and the Picolario. I have been a Picolario user for some years, and find this particular piece of equipment very useful and easy to use. My inputs on the Forum were in favour of the Picolario, this being the one that I have experience with. Sensing my bias towards the Picolario, Neil Stainton of Hyperflight the UK importers of the WSTech unit suggested that I might like to try their unit. See Hyperflight website for details. I am not proposing to do a full review, as Chris Williams has done fine reviews of both units, and has covered most of the operating capabilities. Each of these can be found on this Scale Soaring UK website and Forum. The WSTech unit has 4 operating modes, controlled from one 3 position switch or slider. This probably is clever, but I have yet to use the 4th option in anger because being a bloke, and not able to multitask, I can never remember the correct sequence of switch positions to get Mode 4. Mode 1 is very good for thermalling, it tells you the distance the glider has gone up or down in the previous 20 seconds. Mode 2 tells you the height every 100ft. It also tells you the height again if it has not changed for 60 seconds. (This has never happened to me all the time I have been using it) If you change back to Mode 2 from Mode 1, it tells you the height that you are at. Mode 3 is basically quiet mode. No Vario, and no announcements other than a change in battery voltage. Now here I have to compare the WSTech with the Picolario. In quiet mode the WSTech still transmits a carrier signal, so you get a constant white noise hiss in your ear. The Picolario actually turns off the carrier in quiet mode, so you get silence. This is not a big thing, and it depends on what you are using your vario for. Why would you want to turn the unit off. Well maybe on a long flight where there were so many thermals that you did not really need a vario at all? This utopia must happen for some, but it has never happened for me. My longest thermal flight took place yesterday at the TVSA meeting at Thatcham, 32 minutes with my K8, and I was using the WSTech vario every step of the way. I understand from Neil that future versions of the WSTech unit will also turn off the carrier signal, so I guess that I am not the only one this gets to. The reason that I want to turn it off is that I use a vario in my tug. Longest thermal flight about 60 seconds when the engine cut at 1000ft in Caen a few years ago. I use the vario so that I know if the tug is climbing or diving, especially at height when towing heavy or draggy or heavy draggy gliders. We usually tow up to 1000ft where we have permission, and I can be fairly sure to get everyone to about the same height before giving the usual quiet and controlled command to the glider pilot “GET OFF”. If you are towing all day, it is nice now and again to be able to flip the switch and get some peace and quiet. You need to talk to the glider pilots to calm their nerves before you haul their pride and joy into the wild blue yonder. The other reason that I have a vario in my tug, and I am sure that it is one of the main reason why varios come under the heading of “once used never forgotten”, is that the nice lady keeps telling me the receiver battery voltage. Even if you have the unit in the “off” position you still get the battery information every time it changes by 0.1 volts. This has saved at least 3 gliders that I know of. I have not fiddled with the settings on either the Picolario or the WSTECH units, as I am not much of a fiddler. There will be a those out there who think it is because I cannot be bothered to read the manual, and there may be an element of truth in that. For the fiddlers out there the WSTECH has a multiturn pot that you can fiddle with to adjust the point at which it tells you that you are climbing or diving. (There is some logic in this adjustment when you get used to it). The Picolario comes with a multitude of things to play with, and records details of your last few flights for you to listen to later. (Why?) When you turn the WSTech unit on, it tells you the maximum height and minimum battery voltage of your last flight and this can be a little disconcerting. The sudden panic when you switch on, of being told you are at 1300 feet with a low battery voltage, tends to get the heart rate up until you get used to it. My only real negative with the WSTECH unit is the receiver and earpiece, and this is really based on a comparison with the Picolario unit that I had first. I find that I need to adjust the volume now and again during the day. The Picolario receiver has a knob on top that does just this, as well as being an on/off switch. The WSTECH unit has buttons which have to be operated in the correct order to adjust the volume. Suffice it to say I would not recommend that you try and do this while flying. The Picolario earpiece is a little speaker in a plastic moulding that fits outside the ear, while the WSTECH unit is a little sponge thing that fits in the ear. Now again this is a personal thing, as I have only one good hearing ear, so listening to the vario, and people around shouting at me to get out of the way, etc., all has to be done with the one ear. 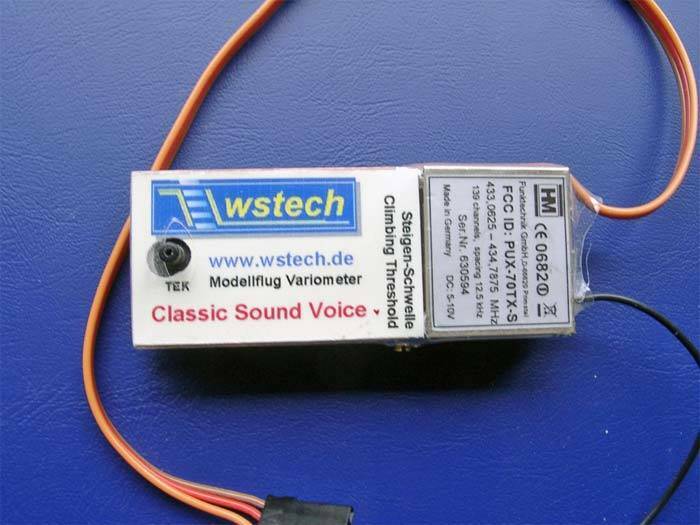 With the WSTECH unit in my ear I can hear very little else other than the vario. To sum up, they are different units that do much the same thing and are both good at it. A direct comparison is difficult because of the differences in operation and hardware. I have grown to like the WSTech unit more than I thought I would. I guess that the bottom line is, I liked it so much I bought one.